After the 1971 war was over, a list of Bengali intellectuals (many of whom were killed) was found in Pakistan Maj. Gen. Farman Ali’s diary. 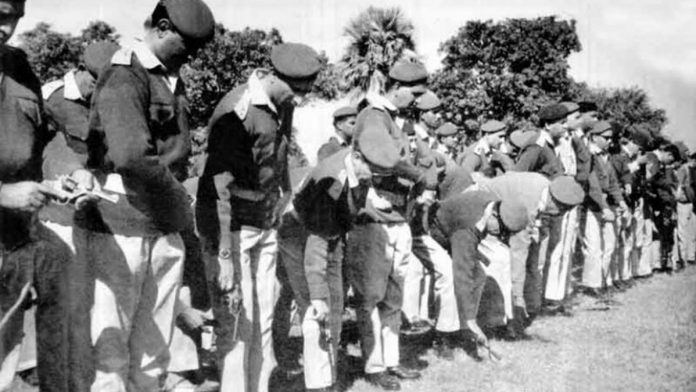 Two days before surrender, Pakistani troops made one final attack to cripple the emerging nation [of Bangladesh]. Asif Munier was 4 years old that year. He lived in his grandparents’ house in Dacca. Asif’s father Munier Chowdhury was a sensitive linguist who taught at the Dacca University. They used to live in a part of the campus near the British Council and after the crackdown on 25 March and the killing of academics they did not feel safe and left their home. Munier Chowdhury taught English and Bengali and was a well-known playwright. Some of his writing was political — in the 1960s he wrote a play, Kobor, about the resurrection from death of the martyrs of the 1952 language movement. He was jailed, and his health suffered, so upon release he focused on writing and teaching and stayed away from overt politics, although he stayed engaged with ideas—he was part of the Pragatisheel Lekhok Songho (Progressive Writers’ Union). Munier was involved with the development of the Bengali keyboard for typewriters, and with the German company, Optima that developed a keyboard, Munier-Optima, which later became a standard in the industry. He was a strong proponent of Bangla. On 14 December, Munier sat at home, listening diligently to the BBC and VOA. He said aloud, ‘It is reaching the end. The good day will come very soon, I can feel it’. Lily had had a surgery so she was resting. Asif’s grandmother was cooking lunch. His younger brother was in the shower. Asif had just had his bath and his father had wiped him dry. The house had an iron gate. The main entrance had a courtyard. Somebody knocked and shook the grill. Asif’s uncle went over to see who it was. When the gate was opened, Munier’s wife and mother could see that there were two or three boys whom they did not recognize, and they were wearing grey kurta pyjamas. The boys asked Asif’s uncle if he was Munier Chowdhury. Asif’s older brother who was 12 was standing nearby, so the uncle sent him away and spoke to the boys. ‘Can you call him? We need to talk to him,’ the boys said. Lily saw a camouflaged van. She could not see the full car, but she could see its roof and its window. It had branches and leaves, and there was mud on the window. Munier was about to have lunch—chapatis, vegetables, and fish which his mother had prepared. It was around 1:30 p.m. He got up, put on his white kurta and started going down. ‘They want to talk, let me find out’, he said. Al-Badr took away many people like Munier that day and brought them to Rayer Bazaar in the Beribadh area of Dacca where potters had lived since Mughal times because the red earth of that area was excellent for making clay pots. The men and women brought here had been tortured and their hands were tied; they were killed near Turag River, where their bodies were dumped—Shahidullah Kaiser, an award-winning novelist from Mazupur; Santosh Chandra Bhattacharyya, a Sanskrit scholar; journalist Syed Nazmul Haque who was arrested during the war and taken to West Pakistan to testify against Sheikh Mujib in his secret trial and then returned to Dacca; linguist Mofazzal Haider Chaudhury whom Tagore’s university in India,Vishwabharati, had honoured; journalist Nizamuddin Ahmed, who frequently acted as a go-between for foreign correspondents, taking them to Mukti Bahini; Dr M.A.M. Faizul Mahi, who quietly helped Mukti Bahini; Sirajul Haque Khan, a US-trained educationist; historian Ghyasuddin Ahmed; physician Mohammad Fazle Rabbi; and poet and journalist Selina Parvin. Between 14 –16 December Al-Badr and Al-Shams tried to enfeeble Bangladesh at its birth. The men and women became part of the clay of this land two days before it became free, their blood joining the water that flowed through the land. Munier’s son Asif is one of the founders of Projonmo Ekattor, an organisation of people orphaned by the war. One night at my home in London he recounted the story of his father being taken away. ‘His body was never found; to us, he just disappeared,’ he said quietly. Farhad Ghuznavi, who was a senior manager at ICI Pakistan, the British chemicals company’s subsidiary, had gone for a board meeting in Karachi on 3 December. The war had broken out so he decided to leave for London, because he had sent his family there. 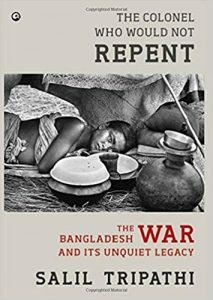 His departure was quite dramatic, as Bengalis leaving the country needed government permission to do so. He was able to leave because ICI had bought his ticket. He returned to Dacca in March. When he went to his home, his neighbour told him he was so glad Ghuznavi was not in Dacca during the final phase of the war. ‘They came for you three times between 3-14 December’, he told Ghuznavi. Ghuznavi’s mother and sister had already moved to her sister’s place, the home was empty. ‘Had I been in Dacca those days, I’d have been taken to Rayer Bazaar,’ he thinks. Niloufer Huda heard about the fall of Jessore in a radio broadcast and decided to go to Jessore. They saw thousands of people walking to the border. Who had organized those killings? The Bangladesh International Crimes Tribunal has sentenced in absentia one British Bangladeshi for playing a role in those killings, but it has been widely assumed that Maj. Gen. Rao Farman Ali bore some responsibility. After the war was over, a list of Bengali intellectuals (most of whom were killed on 14 December) was found in a page of Farman Ali’s diary that he had left behind at the Governor’s House. Ali confirmed the list as genuine but denied that the aim was to kill the people. Altaf Gauhar, a former Pakistani journalist and bureaucrat, also confirmed the list. He said hehad seen the name of a friend of his on the list and requested Farman Ali to cancel it, and Farman Ali had obliged. Gen. Farman Ali continued to deny that he had any role in those killings. But he understood the city well, knew the elite, and since Operation Searchlight, had a very good idea of what the troops were doing. Farman Ali’s defence over the Rayer Bazaar killings is that the bodies were found only on 17 December, by which time the Pakistani army had surrendered. He claimed that a week earlier Maj. Gen. Jamshed had called him to the army headquarters and asked him to join him on a car ride. During the journey he told him that they were thinking of making some arrests of civilians. Farman Ali claimed he advised against it and did not know what happened after that. 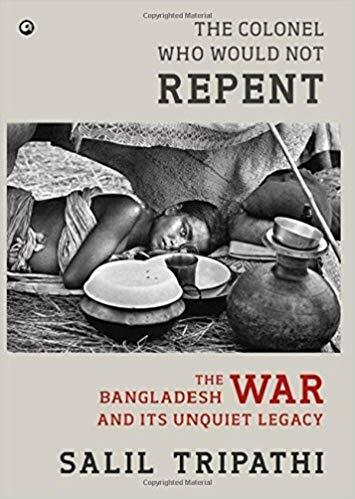 This excerpt from the book ‘The Colonel Who Would Not Repent: The Bangladesh War And Its Unquiet Legacy’ by Salil Tripathi has been published with permission from Aleph Book Company.